Changes in the response of water and sediment have brought imbalances in present land resources as well as future management practices. Such critical areas need to be identified and prioritized for conservation and protection interventions. The Betwa River basin, located in the central part of India, has natural resources problems due to hydrologic changes. Thus, the present study has been focused on water–sediment interaction and prioritization of critical areas identified from a simulation using the Soil and Water Assessment Tool (SWAT). A downscaled and bias-corrected CMIP5 global climate model dataset has been used to simulate the water and sediment yields of the river basin. The analysis period was grouped into a 20-year period starting with a baseline of 1986 (from 1986 to 2005) and four future horizons, i.e. horizon 2020 (2020–2039), horizon 2040 (2040–2059), horizon 2060 (2060–2079) and horizon 2080 (2080–2099). Based on the sediment yield obtained from the SWAT simulation, identification of an empirical relationship and prioritization of critical areas were carried out. Results show that the relationship between annual water and sediment yields has a good correlation (R2 = 0.75) for horizon 2020; however, a low correlation (R2 = 0.63) was observed for horizon 2060. The analysis reveals that the water–sediment interaction will be affected due to changes of monsoon precipitation in future. Based on priority treatment, the critical sub-watersheds were identified and prioritized for the baseline as well as future climate horizons. Analysis shows that the sediment yield of sub-watersheds SW-5, SW-6, SW-11, SW-17, SW-18, SW-34 and SW-45 has increased with changing climate conditions. Further, these sub-watersheds would undergo changes in erosion class from moderate to very severe. Thus, the identified critical sub-watersheds for the baseline as well as for future climate conditions need to be considered for prioritization and management. The present approach can be used for sub-watershed-level sustainable planning and management. 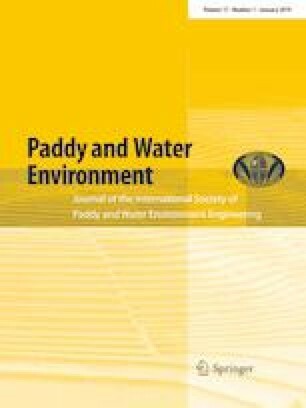 The authors sincerely acknowledge the Department of Water Resources Development and Management, Indian Institute of Technology (IIT) Roorkee, India, for providing research facilities necessary for carrying out this research work. Furthermore, the second author would like to acknowledge the Ministry of Human Resource Development (MHRD), Government of India, for providing financial support in the form of a scholarship during his Ph.D. study at IIT Roorkee.